Your community members are pretty awesome. Have you ever wanted to give them a visual reward for being so awesome? 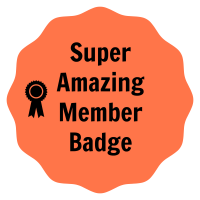 First, create your beautiful badge graphic. Next, go to your control panel and click Basics > Profile Fields. Click "add profile field." Choose Photo for the "field type." You might want to drag the new field to the top of the list, if you have other custom profile fields visible on the member's profile page. Name the new field (perhaps "Badges"). Make the new profile field Public, and admin-editable only. To add a badge to a member's profile, just edit their profile and upload the badge as an image in the new custom profile field. If you like my fantastically designed, (non) award-winning fake badge above, feel free to borrow it. Or share your own real designs here! That is a cool idea, Julie, I'll make sure it goes into the "for consideration" hopper. We already do that with Database fields, so there's a precedent. Right, the collaging takes a lot more time though because people can have different combinations of badges. Wanted them all in one field, as the one field already takes up a ton of space in the member profile. Hope you will consider a gallery-style photo upload option here. Nice idea. Is there a way to upload multiple badges to this same field? I have a situation where people can accumulate more than one honor and it would be nice to be able to accommodate at least 3 badges here. Hi Julie! You could do that a couple of ways: first, you could just create three fields; second, you could collage the three images and upload them into the field as one image.